Brunswick Song Project Take this space (Dave Brown / Matthew Lees / Julie McKinnon) This song was written for the opening of our updated church space and it would be good to sing it again this week. ATW 487 Make your home in me (Fay White). 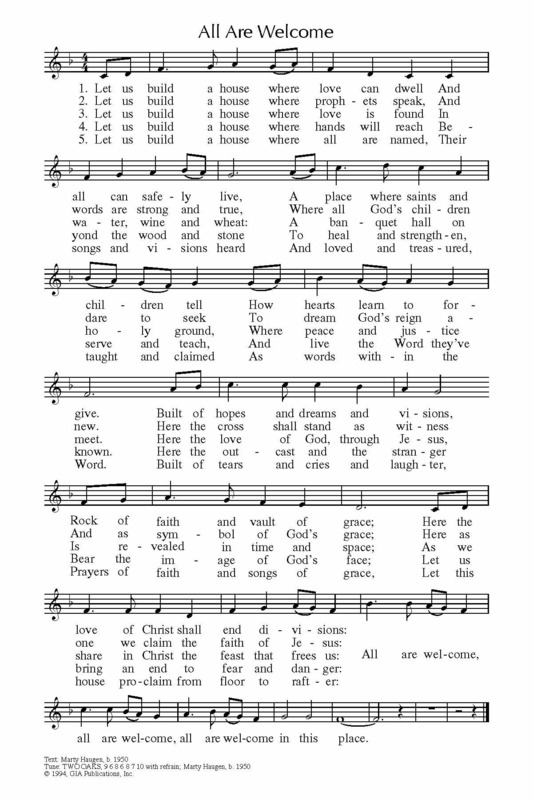 The chorus is simple, but the verses are somewhat tricky (maybe get a soloist to sing the verses). “If you fly to the point of the day’s sunrise or westward across the sea, if you travel to the uttermost ends of the earth, there I will be; Make your home in me as I make my home in you. I am everywhere that you can be. Make your home in me”. Sound sample (a solo version which makes it sound even tricker...). Lyrics. Online Resource In my father's house (Paul Somerville) A great new song of unity, with an inspiring, and very singable chorus. Free downloadable songbook. Good for older kids & teenagers. *Online Resource Here's a new day (Helen Wiltshire) Great words about the sacred space that we meet in, and our connections to each other. Sheet music online. TiS 46 / AoV2-96 / GA518 My peace be upon you for ever / I will sing forever of your love, O Lord (Christopher Willcock) A very nice paraphrase of the psalm. 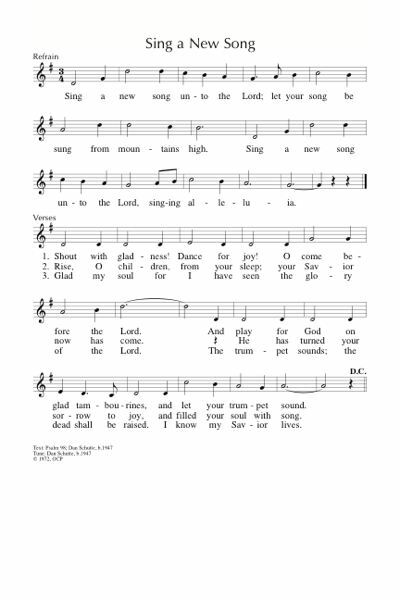 The refrain is very simple and inclusive and can be used for either a read or cantor-sung Psalm. “My peace be upon you forever, my love be within your heart, my Spirit will keep you safe all your days”. This is also in New Song in an Ancient Land Vol 1 (in the Liturgy Library at BUC). AoV1-080 / ATA 150 / GtG276 / G(II)384 / GC538 / GC(II)544 / G(3)607 / URW296 / Lau697 Sing a New Song Unto the Lord (Dan Schutte) Good, joyous words and a simple joyous tune. It is not inclusive in all sources. Lead sheet and lyrics. Sound sample. *Emergent Psalter Blessed be God forever Amen and amen (Isaac Everett) An excellent simple refrain. Sheet music (refrain only - click on the "download" tab). PfAS089B Forever I will sing (Marty Haugen) Simple Psalm refrain. MV147 God help us to treasure (John Oldham) Lovely words asking God to help us to just pay attention and remember how wonderful life is. Simple tune. PfAS089D Forever we will sing (Michael Morgan / Martin Tel) Very straightforward paraphrase. Formal old tune (GENEVAN 89). New words to old tunes. NCH29 / Iona (SBL) / GC538 / G(II)385 Let heaven your wonders proclaim (John Bell) This simple folk tune style tune has good, inclusive words. NCH and Iona books have a lovely arrangement for the verses, but it can also be sung in unison; especially nice with guitar if you have a guitarist in your congregation. *AoV2-139 / GA525 / SP&P045 Gather us O God Body spirit soul and mind (Monica Brown) Very simple song. Would work well as a gathering chant. "Gather us O God, Body, spirit, soul and mind. Gather us, O God, One in union now with you"
The Lord is my shepherd. Again. NCYC'07 Lead me on (Paul Gioia) A pretty cool gospel rock song. URW196 / StF652 Lord we come to ask your healing (Jean Holloway) Good words to speak peace in times of division, verse 3 also speaks about unity in communion. Sung to the familiar tune AR HYD Y NOS New words to old tunes. VU359 / AA059 / W&R454 / STB205 / Online Resource He came singing love (Colin Gibson) A lovely image and reasonably straightforward song. Might need to be taught. Lyrics. MV169 When hands reach out beyond divides (Keri Wehlander / Linnea Good) Can be sung to a range of tunes. "When fear no longer guides our steps and days of war are done, God's dream for all shall live anew; our hearts will heal as one". *AoV1-091 / AoVK-68 / StS016 / G(II)527 / GC(II)720 / G(3)821 / LUYH923 Peace before us peace behind us (David Haas) love this one. Reflective. Careful not too get too schmaltzy because it's long. Less is more. It's good to do something while singing this song. Passing the peace slowly? I don't know... Schmaltzy and SLOW sound sample. Lead sheet. Good for kids. TiS 778 / UMH666 / Cha436 Shalom to you (Elise Eslinger) A simple song of peace to a traditional Spanish melody (SOMOS DEL SEÑOR). NCH054 / VU397 / WoV750 / LBW88 / ELW322 / PH471 / CP396 O praise the gracious power (Thomas Troeger) Good words of the world's salvation and the way the cross breaks down all that divides us. Sung to a joyful tune CRHISTPRAISE RAY. TiS 672 / GA554 Lord of earth and all creation (Honor Mary Thwaites) A call for renewal of creation and all God's created people in Australia. Two possible tunes. The newer tune is very good, but if your congregation can't do a new tune this week, it can also be sung to WESTMINSTER ABBEY which is very well known. Lyrics (split by words of mission and blessing). New words to old tunes (if you want). NCH332 / VU457 / ELW522 / SFFS 2268 / HPP528 / GC(II)738 / G(3)839 / CP061 / W&R695 As We Gather at Your Table (Carl Daw) Could be sung to HOLY MANNA, BEACH SPRING or NETTLETON, all very popular hymn tunes (did I mention that two of them are Sacred Harp tunes? ), particularly good if you are celebrating communion this week. Lyrics and sheet music. New words to old tunes. AoV1-106 / UMH376 / WoV774 / ELW753 / GtG752 / G(II)528 / GC730 / GC(II)724 / G(3)822 / CP562 / Cha297 / URW443 / 82Hml-712 / Lau904 Dona Nobis Pacem (American folk song) This is very well known, and would fit well with this reading. Good for kids. *Iona (M&G) / ATAR609 / CH359 / MV033 / GtG137 / ZSS54 / StJ / ELW253 / GA293 / SFFS 2085 / G(II)276 / GC370 / GC(II)364 / G(3)429 / CP368 / W&R402 He came down that we may have love / Jesus came bringing us hope (Traditional Cameroon) A lovely simple song - you can make up words and have a lot of fun with this if you also use some drums. 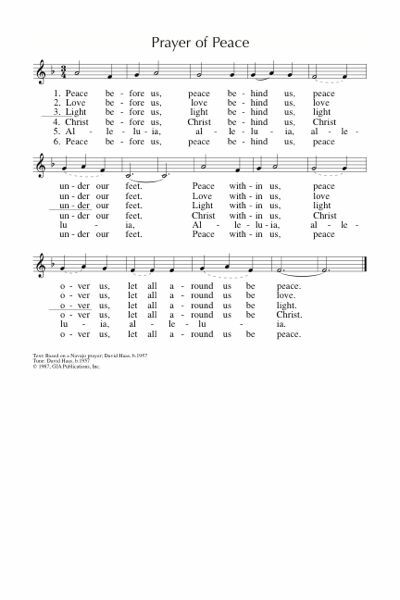 For Brunswick this year, this will be a nice reminder of Advent, when we sang this every week. Scottish sound sample. Good for kids. CH656 / VU477 / PH507 / CP060 / A&M448 / GtG515 / CP(E) 305 / W&R706 / Cha420 / SP217 / URW120 / StF588 I come with joy a child of God (Wren) A good and jubilant communion hymn. Lyrics and sheet music. AoV1-129 / CH665 / UMH620 / VU467 / ELW701 / HPP525 / A&M461 / GtG530 / G(II)599 / GC830 / GC(II)813 / CP073 / W&R689 / Cha393 / Lau832 One bread, one body (John Foley) A classic. Don't play it too slow or it takes forever!! Particularly appropriate if you are celebrating communion. Jesus and the disciples go away and come back again. Stuff happens in the middle but we don't read about it. Rest. *FFS028 God rest us (Michael Leunig) I would love it if we could all teach this beautiful song to our congregations, so that they can call on it when they are tired. "God rest us. Rest that part of us which is tired. Awaken that part of us which is asleep. God awaken us, and awake within us. Amen". Perfect. Slow. AoV2-049 My Soul Is At Rest (Trish Watts) This is just completely beautiful. It is also on Trish's album "Invokation". TiS 33 / VU779 Rest in God alone (Robert Batastini) A lovely simple and inclusive refrain that could be used on its own for this reading since it's actually a Psalm setting. That's enough from me. What will you be singing? I'd love to hear your ideas too. Please add a comment below! 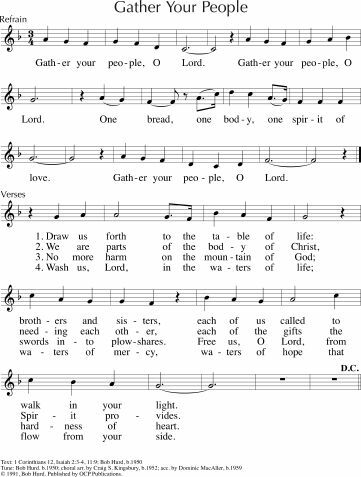 Focusing on the Ephesians reading we'll be sharing the peace and then singing TiS 445 (Jesus where e'r your people meet)to begin. As a dismissal song we are going to gather people around the table and sing one another out with TiS 778 (Shalom to you).